We have winter weather now and soup is always good. I had about six slices of thick sliced applewood smoked bacon and a small head of cabbage so made bacon cabbage soup for supper. 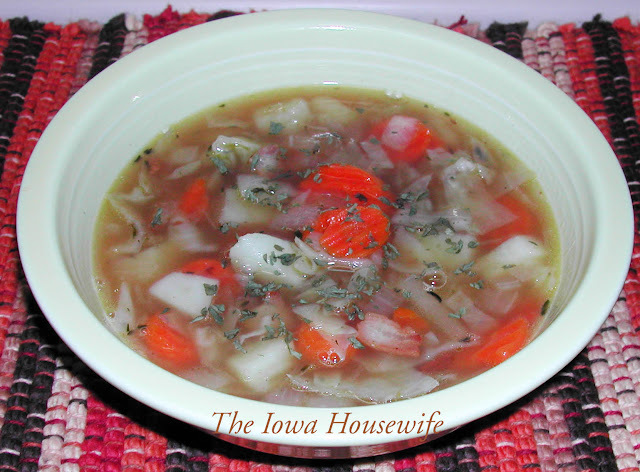 As I did not want it all cabbage, I added some frozen carrots, onions and potatoes to the soup. Turned out very well and we ate all of the small batch I made. I really don’t mind leftovers of soup as it usually is better the next day but this was gone so I am going to write down what I did so I can make it again. The key is having some good chicken stock and sautéing the carrots and onion in about a tablespoon of the bacon fat so they have a browned taste for the added flavor. Any vegetable will taste better for the few minutes spent sautéing it in some butter or other fat. You could vary the vegetables in this soup but this is a good, simple combination and highlights the cabbage. onions and carrot slices till the onions are opaque and the carrots are starting to brown. Add the chopped potatoes and cook for about 2 minutes more. Add broth, bring to a slow boil and add the bay leaf, thyme and salt and pepper. Cook for about 15 minutes and then stir in the cabbage and bacon. Reduce heat to low and cook about 15 to 20 minutes longer until the cabbage is tender but not limp. Serve hot with cornbread or rolls or crackers. Sounds delicious as well as simple to do. Thanks! Thanks Sandy, it really hits the spot on a cold day. This sounds really good. I love cabbage...cooked or raw! My hubby isn't fond of it cooked though so I'd have to make a smaller amount. Hey Nadine, good to hear from you. We all like cabbage here so I make this more. It does help not to cook the cabbage too long. It is not as strong tasting that way.